Junior took a peak. So much to see! 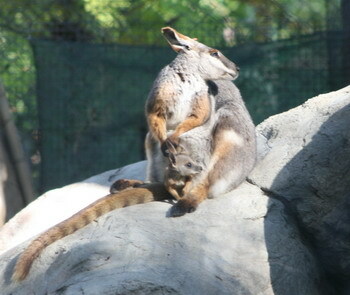 After a few minutes Mom gave him a pat on the head and Junior returned to the safety of the pouch. Mom is always right, little one, better safe than sorry. Sometimes I wish there was a safe warm pouch I could hide in, don’t you? Oh yes, Karen, oh yes!